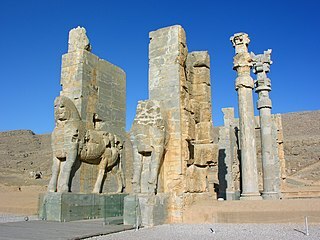 This article lists the monarchs of Persia , who ruled over the area of modern-day Iran from the establishment of the Median Empire by Medes around 705 BC until the deposition of the Pahlavi dynasty in 1979. Frataraka is an ancient Persian title, interpreted variously as “leader, governor, forerunner”. It is an epithet or title of a series of rulers in Persis from 3rd to mid 2nd century BC, or alternatively between 295 and 220 BC, at the time of the Seleucid Empire, prior to the Parthian conquest of West Asia and Iran. Studies of frataraka coins are important to historians of this period. 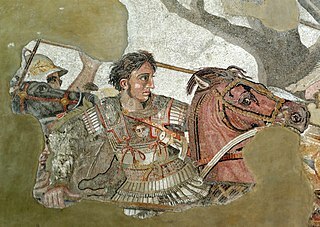 The Seleucid Empire was a Hellenistic state ruled by the Seleucid dynasty which existed from 312 BC to 63 BC; Seleucus I Nicator founded it following the division of the Macedonian Empire vastly expanded by Alexander the Great. Seleucus received Babylonia and from there expanded his dominions to include much of Alexander's near-eastern territories. 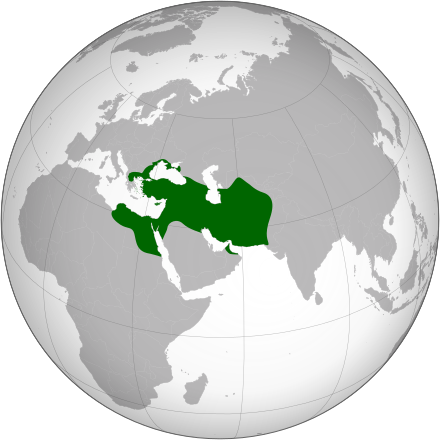 At the height of its power, the Empire included central Anatolia, Persia, the Levant, Mesopotamia, and what is now Kuwait, Afghanistan, and parts of Pakistan and Turkmenistan. 8 Vadfradad III 1st century BCE (1st half) ? Sub-king of the Parthian Empire. Coin legend wtprdt mlk (ࡅ‬ࡕ‬ࡐ‬ࡓ‬ࡃ‬ࡕ ࡌ‬ࡋࡊ‬, "King Vadfradad") in Aramaic script. Parthia is a historical region located in north-eastern Iran. It was conquered and subjugated by the empire of the Medes during the 7th century BC, was incorporated into the subsequent Achaemenid Empire under Cyrus the Great in the 6th century BC, and formed part of the Hellenistic Seleucid Empire following the 4th-century-BC conquests of Alexander the Great. The region later served as the political and cultural base of the Eastern-Iranian Parni people and Arsacid dynasty, rulers of the Parthian Empire. The Sasanian Empire, the last state of pre-Islamic Persia, also held the region and maintained the Seven Parthian clans as part of their feudal aristocracy. The Great King, Theopator, Euergetes, Epiphanes, Philhellene, Eusebes Arsaces XVI  Arsaces(?) or Vardanes(?) or Vonones(?) ? ? 77–66 BCE 66 BCE The most obscure major monarch of the first millennium BC. Nothing about him is currently known. The Great King, Philopator, Euergetes, Epiphanes, Philhellene Arsaces XVIII  ? ? probably son of Arsaces XVI 66–63 BCE 63 BCE The second most obscure monarch of the first millennium BC, nothing about him is known.
? Arsaces XXIV Mithridates  ? Probably a descendant of Arsaces XIII Mithridates 12–9 BCE ? ↑ Behistun Inscription: This is Phraortes. He lied, saying: "I am Khshathrita, of the dynasty of Cyaxares. I am king in Media." ↑ "Ahasuerus". JewishEncyclopedia.com. Retrieved 2014-07-25. ↑ CNG: KINGS of PERSIS. Vādfradād (Autophradates) II. Early-mid 2nd century BC. AR Tetradrachm (25mm, 16.23 g, 11h). Istakhr (Persepolis) mint. ↑ Rezakhani, Khodadad (2010). The “Unbekannter König III” and the Coinage of Hellenistic and Arsacid Persis. 1 2 Assar, 2004.Assar, 2005. Assar, "Moses of Choren & the Early Parthian Chronology", 2006. 1 2 3 4 5 6 7 Qashqai, H., "The successors of Mithridates II"
1 2 3 4 5 6 7 Assar, G.R.F., "A Revised Parthian Chronology of the Period 165-91 BCE" Qashqai, H., "The successors of Mithridates II"
↑ Assar, G.R.F., "A Revised Parthian Chronology of the Period 165-91 BCE"
Susa was an ancient city of the Proto-Elamite, Elamite, First Persian Empire, Seleucid, Parthian, and Sasanian empires of Iran, and one of the most important cities of the Ancient Near East. It is located in the lower Zagros Mountains about 250 km (160 mi) east of the Tigris River, between the Karkheh and Dez Rivers. The site now "consists of three gigantic mounds, occupying an area of about one square kilometer, known as the Apadana mound, the Acropolis mound, and the Ville Royale mound." Persis, better known as Persia, or "Persia proper", is a region located to the southwest of modern Iran. The Persians are thought to have initially migrated either from Central Asia or, more probably, from the north through the Caucasus. They would then have migrated to the current region of Persis in the early 1st millennium BC. The country name Persia was derived directly from the Old Persian Parsa. King of Kings was a ruling title employed primarily by monarchs based in the Middle East. 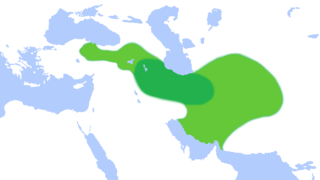 Though most commonly associated with Iran, especially the Achaemenid and Sasanian Empires, the title was originally introduced during the Middle Assyrian Empire by king Tukulti-Ninurta I and was subsequently used in a number of different kingdoms and empires, including the aforementioned Persia, various Hellenic kingdoms, Armenia, Georgia and Ethiopia. Anshan, modern Tall-i Malyan, was an ancient city. The site is located 46 km north of Shiraz, in the Beyza/Ramjerd plain, in the province of Fars in the Zagros Mountains, south-western Iran. The history of Khuzestan Province, a province in southwestern Iran, extends from the ancient pre-Aryan Elamite civilization to the modern day Islamic Republic. Elymais or Elamais was a semi-independent state of the 2nd century BC to the early 3rd century AD, frequently a vassal under Parthian control, and located at the head of the Persian Gulf in the present-day region of Khuzestan, Iran (Susiana). It is reported that these people were great archers and natives of Susa, which lay to the east of Elymais territory. Most of the Elymais were probably descendants of the ancient Elamites, who once had control of that area in the past. The provinces of Elymais were Massabatice, Corbiane and Gabiane. Characene, also known as Mesene (Μεσσήνη) or Meshan, was a state founded by the Iranian Hyspaosines within the Parthian Empire located at the head of the Persian Gulf. Its capital, Charax Spasinou, was an important port for trade between Mesopotamia and India, and also provided port facilities for the city of Susa further up the Karun River. Characene was mainly populated by Arabs, who spoke Aramaic as their cultural language. 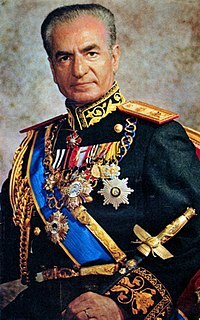 All rulers of the principality had Iranian names. The Awan Dynasty(Sumerian: ≿‭↠, awan) was the first dynasty of Elam of which anything is known today, appearing at the dawn of historical record. The Dynasty corresponds to the early part of the Old Elamite period, it was succeeded by the Shimashki Dynasty and later the Sukkalmah Dynasty. The Elamites were likely major rivals of neighboring Sumer from remotest antiquity; they were said to have been defeated by Enmebaragesi of Kish, who is the earliest archaeologically attested Sumerian king, as well as by a later monarch, Eannatum I of Lagash. 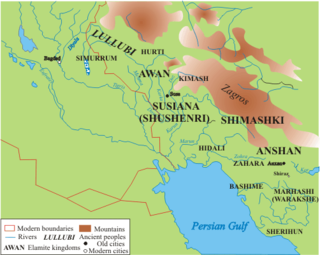 The Shimashki or Simashki dynasty was portrayed as an early dynasty of the ancient region of Elam, to the southeast of Babylonia. A list of twelve kings of Shimashki is found in the Elamite king-list of Susa, which also contains a list of kings of Awan dynasty. It is uncertain how historically accurate the list is, although some of its kings can be corroborated by their appearance in the records of neighboring peoples. The Dynasty corresponds to the middle part of the Old Elamite period. It was followed by the Sukkalmah Dynasty. Shimashki was likely near today's Isfahan. The Kings of Persis are a series of Persian kings, who ruled the region of Persis in southwestern Iran, from the 2nd century BCE to the 3rd century CE. They ruled as sub-kings of the Parthian Empire, until they toppled the Parthians and established the Sassanid Empire. They effectively form some Persian dynastic continuity between the Achaemenid Empire and the Sasanian Empire. The Sukkalmah Dynasty, also Epartid Dynasty after the founder Eparti/Ebarat, was an early dynasty of West Asia in the ancient region of Elam, to the southeast of Babylonia. It corresponds to the latest part of the Old Elamite period.